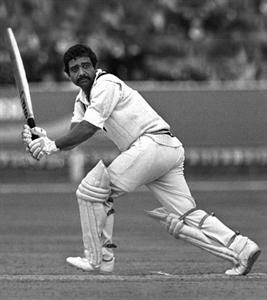 This article is about a former Indian cricketr and an elegant batsman - Gundappa Viswanath. Mostly known for his wristy batting and style Viswanath is a batsman in the difficult situation. Here is his profile, career and records in this article. Gundappa Viswanath is a former Indian cricketer and considered amongst the Top Class batsman in Indian cricket history. He also served as a Match Referee in International Matches for ICC. In year 1969, Viswanath made a very successful debut in International Cricket by playing a century knock in his First Test Match against Australia. He always plays valuable innings in difficult situations for Team. His innings of Unbeaten 97 runs against West Indies is 38th amongst The Wisden's Top 100 Innings of all time. His another innings of 114 against Australia is also among the Top 100. His another century of 112 runs against West Indies at Port of Spain is another example of his master class. This innings led to a record victory in that match, as it was the highest run-chase in Test Cricket at that time. India successfully chases the target of 403 in that match. Viswanath also has captained the Indian Test Team in couple of matches. He also played ODI Cricket and appears in the World Cup 1975 and 1979. But he is not successful in both terms - as a captain and as an ODI player. His Batting average of 19.95 in ODIs in 25 Matches tells the story itself.